Just a reminder that we will be closed from Monday, December 22 through Friday, December 26 2014 for the holidays. We will reopen for our regular hours for the weekend of December 27-28, 2014 from 8am-3pm. We will be closed on Wednesday 12/31 for New Year’s Eve. 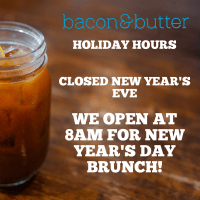 We will open for brunch on New Year’s Day at 8am! Fresh baked pastries for your Sacramento office!